In Mississippi, you can execute a general power of attorney that authorizes your agent to conduct a wide range of activities on your behalf. 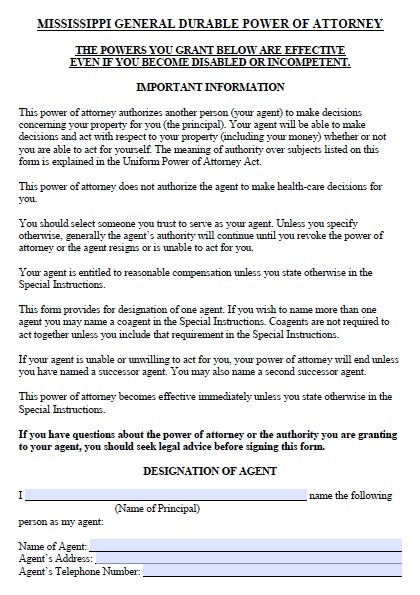 You can also execute a limited power of attorney, which will enable you to grant the agent a smaller number of powers. For example, you can simply enable the agent to accept insurance payments and deposit them into your bank account. A limited authority like this can be more appropriate if you don’t have many financial transactions to perform, or if you just need someone to take over a few particular duties that are inconveniencing you. You must exercise caution when choosing an agent. The agent will potentially have a great deal of control over your property, with the abilities to withdraw your money or sell your assets. You must only choose someone you have complete trust in.